A delicate effort to reach a young girl buried in the rubble of her school due to Tuesday's earthquake stretched into a daylong vigil for Mexico, much of it broadcast across the nation as rescue workers still struggled in rain and darkness early Thursday trying to pick away unstable debris and reach her. See CBC News's later story on the rescue efforts. A delicate effort to reach a young girl buried in the rubble of her school following Tuesday's earthquake stretched into a daylong vigil for Mexico, much of it broadcast across the nation as rescue workers still struggled in rain and darkness early Thursday trying to pick away unstable debris and reach her. Rescuers said the girl told them her name was Frida Sofia. Vladimir Navarro spent the night working at the site of a collapsed school. 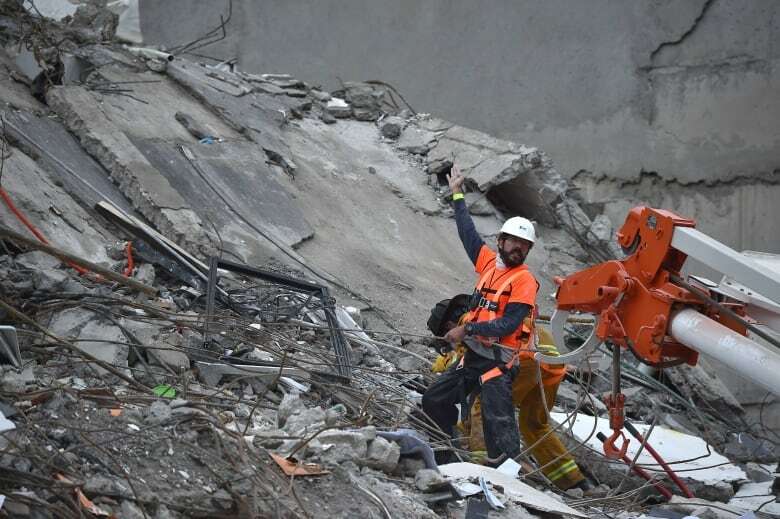 The university worker said rescuers are "just metres away from getting to the children," but the rubble is unstable and they can't access it until it is shored up. "Taking any decision is dangerous," Navarro said, adding they need a large crane to come in and help. 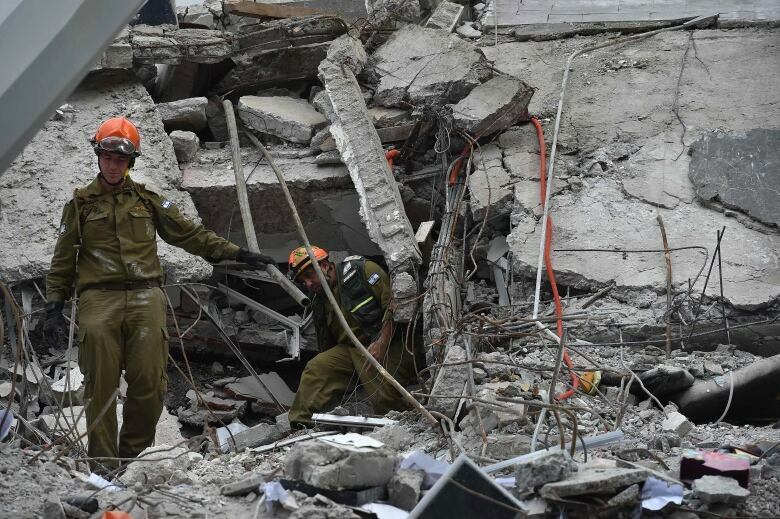 Late Thursday morning, rescuers were trying to reinforce what's left of the school as part of the efforts to free Frida Sofia. The remains of the building had shifted dangerously earlier Thursday morning, prompting some rescuers to evacuate the top of the rubble pile. Workers are using iron beams to prop up the structure. It took a dozen or more men to carry each one. Stretchers have also been brought to the edge of the building. A large crane is also on site. The death toll rose after Mexico City Mayor Miguel Angel Mancera said the number confirmed to have died had risen from 100 to 115. An earlier federal government statement had put the overall toll at 230, including 100 deaths in Mexico City. Mancera also said two women and a man had been pulled alive from a collapsed office building in the city's centre Wednesday night, almost 36 hours after the quake. Even as President Enrique Pena Nieto declared three days of mourning, soldiers, police, firefighters and everyday citizens kept digging through rubble, at times with their hands gaining centimetres at a time, at times with cranes and backhoes to lift heavy slabs of concrete. "There are still people groaning. There are three more floors to remove rubble from. And you still hear people in there," said Evodio Dario Marcelino, a volunteer working with dozens of others at a collapsed apartment building. A man was pulled alive from a partly collapsed apartment building in northern Mexico City more than 24 hours after the quake and was taken away in a stretcher, apparently conscious. In all, 52 people had been rescued alive, the city's Social Development Department said, adding in a tweet: "We won't stop." It was a race against time, Pena Nieto warned in a tweet of his own saying that "every minute counts to save lives." Dr. Alfredo Vega, who was working with the rescue team, said Frida Sofia had been located alive under the pancaked floor slabs. Rescuers carried in lengths of wide steel pipe big enough for someone to crawl through, apparently trying to create a tunnel into the collapsed slabs of the three-storey school building. But a heavy rain fell during the night, and the tottering pile of rubble had to be shored up with hundreds of wooden beams. People have rallied to help their neighbours in a huge volunteer effort that includes people from all walks of life in Mexico City, where social classes seldom mix. Doctors, dentists and lawyers stood alongside construction workers and street sweepers, handing buckets of debris or chunks of concrete hand to hand down the line. At a collapsed factory building closer to the city's centre, giant cranes lifted huge slabs of concrete from the towering pile of rubble, like peeling layers from an onion. Workers with hand tools would quickly move in to look for signs of survivors and begin attacking the next layer. "There are sounds [beneath the rubble], but we don't know if they are coming from inside or if it is the sound of the rubble," Herrera said. In Atzala in Puebla state, villagers mourned 11 family members who died inside a church when it crumbled during a baptism for a two-month-old girl. People at the wake said the only ones to survive were the baby's father, the priest and the priest's assistant. There are currently 3,320 Canadians known to be in Mexico. Registration with the federal government is voluntary, however, and that figure "may not reflect the actual number," said Philip Hannan, spokesperson for Global Affairs Canada. "As of Wednesday morning, there have been no reports of Canadian casualties," he said. In a statement issued Tuesday night, Foreign Affairs Minister Chrystia Freeland said, "The government of Canada is ready to assist Mexico as needed and appropriate." She stressed that Canadians requiring consular assistance should contact Global Affairs toll-free at 1-613-996-8885 or by email at sos@international.gc.ca.